Honey bees and other pollinators are dying off at unprecedented rates around the world. First in France, then in the U.S. and elsewhere, colonies have been mysteriously collapsing with adult bees abandoning their hives. In 2006, two years after this phenomenon hit the U.S., it was named “Colony Collapse Disorder,” or CCD. 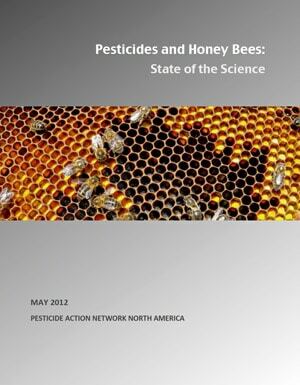 Each year since, U.S. beekeepers have reported annual hive losses of 29-36%. Commercial beekeepers tell us that their industry, which is the care and cultivation of an indicator species, is on the verge of collapse. Honey bees pollinate 71 of the 100 most common crops that account for 90% of the world’s food supply, making managed honey bees the most economically important pollinator. In the U.S. alone, 2000 data from the U.S. Department of Agriculture (USDA) indicates that this industry was worth more than $15 billion per year twelve years ago. With the subsequent growth of U.S. agriculture and decline of natural pollinators, commercial beekeeping likely contributes much more than $15 billion to the U.S. economy now. Claims of imminent food system collapse are not supported by pollination biologists, but without pollination, agriculture quickly becomes less efficient—requiring more land and water to grow the same amount of food—and our diets lose nutritionally vital variety. For instance, most fruits and many nuts rely on the pollination services of bees, including almonds, blueberries, apples and melons. Alfalfa, which is a primary feed source for dairy cows, relies on bees for pollination as well. Altogether, more than one in every three bites of food depends on honey bees for pollination.